Arbor Week is a special week that has been set aside for the planting and caring of trees. Arbor Day originated in Switzerland during the 15th century to raise awareness amongst people about the importance of trees. In South Africa, Arbor Day started in 1983 and in 1997 it was extended to a National Arbor Week. In South Africa, Arbor Week falls in the first week of September. Every South African Arbor Week celebration highlights at least two specific trees – one common and one rare species. Arbor Week celebrations intend to promote a better understanding of trees, in particular indigenous trees; encourage the planting of trees and greening activities within communities; highlight the importance of trees for a sustainable future and the role trees play in the livelihoods of people and their environment; and raise awareness amongst South Africans about greening initiatives. 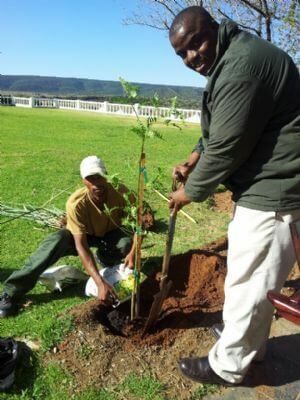 In support of arbor week, the staff of Longlee Manor, enhanced their already manicure gardens by planting the Tree of The Year Virgilia orboroides.